Kenya Wildlife Service has announced its strategy to bring on board private investors for its zip line venture, in line with government initiatives to boost tourism experiences. 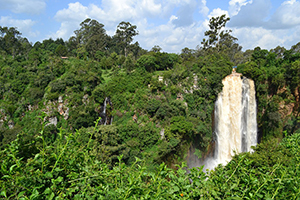 It said it has identified the location where the zip line will be erected over the scenic Sheldrick Falls, in Shimba Hills Game Reserve, which has continued to attract visitors daily. The project would give visitors a bird’s eye view of the lush hilly surroundings from a height of over 250ft. Shimba Hills Game Reserve is rich in flora and fauna and hosts the world’s highest density of African elephants. Other species that roam the Shimba wild include the rare sable antelope, elephant shrew, bushy tailored mongoose and other small mammals like fruit bats. The area is also an important bird area with 111 bird species, 22 of which are endemic to the region.